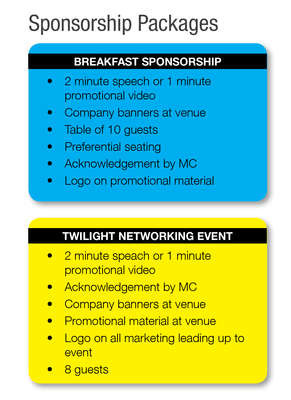 You now have the opportunity to sponsor an event and align your brand with Gold Coast Central Chamber of Commerce. With an impressive list of members, sponsorship means that business leaders will get to know your business and this in turn will give a significant boost to your company's profile and. Sponsorship will help create brand awareness, access potential customers and build credibility. This is an opportunity to reach a captive audience of business executives and to increase your sales. To find out more about Sponsorship and promotion your event please contact our team on Ph: 07 5578 7184 or on email. Events Pages - 2 Spots Available.